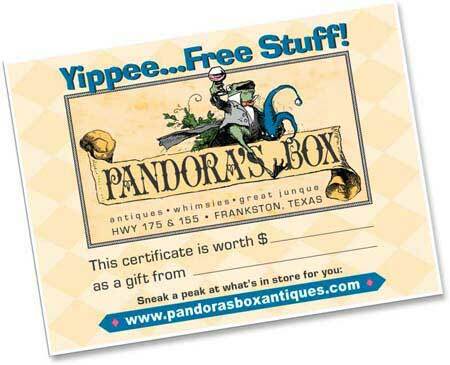 Pandora's Box in Frankston, Texas near Tyler and Lake Palestine...Antiques, Architectural Salvage, Primitives, Stained Glass, Imports, Perennials and Garden Goods, Estate Items! Flaunt your good taste and give a Pandora's Box gift certificate -- availalble in all dollar amounts, large and small. Save the trip! Call and make arrangements to have your certificate mailed to your door ... does gift-giving get any groovier than that? For Christmas, anniversaries, birthdays, Valentine's Day, house-warmings, weddings ... choose the foolproof gift with universal appeal. Banish the boring and buy our Bux!